Orrin Williams recalls that, during his childhood in Englewood in the fifties and sixties, there was a corner store at 61st and Stewart owned by “Mr. Thomas.” Mr. Thomas also sponsored the local Little League and Coney League teams, and Williams and many of his peers played for Mr. Thomas starting at around age nine or ten. “We spent our quarters, nickels, and pennies back in those days with him, which allowed him to return that money to the community in the form of supporting and sponsoring youth baseball teams,” said Williams, now Director of the Center for Urban Transformation, a community development planning organization focused on social and environmental justice. He described Mr. Thomas’s store as having a slightly wider variety than the convenience-store-type offerings of today’s Englewood corner stores. But a lot has changed in Englewood since the days of Mr. Thomas. Williams held up his story of the community-focused, baseball-coaching store owner as an example of the local, black business economy that once thrived on the South Side, but has since, in his words, “collapsed.” Nowadays in Englewood, few corner stores are owned by African Americans; Englewood is often called a “food desert,” and its poverty rate is forty-two percent. In summer or fall of 2016, however, a Whole Foods Market will open in Englewood at 63rd and Halsted, the site of the historic Englewood Mall, once the second-most-visited shopping district in Chicago. The store was announced in September 2013 by Mayor Rahm Emanuel and late 16th Ward Alderman JoAnn Thompson. Right now, the future Whole Foods is just a construction site: piles of dirt accented by debris and the occasional orange cone, surrounded by a high green fence, with caution tape blocking the sidewalk wherever there’s a break in the fence. 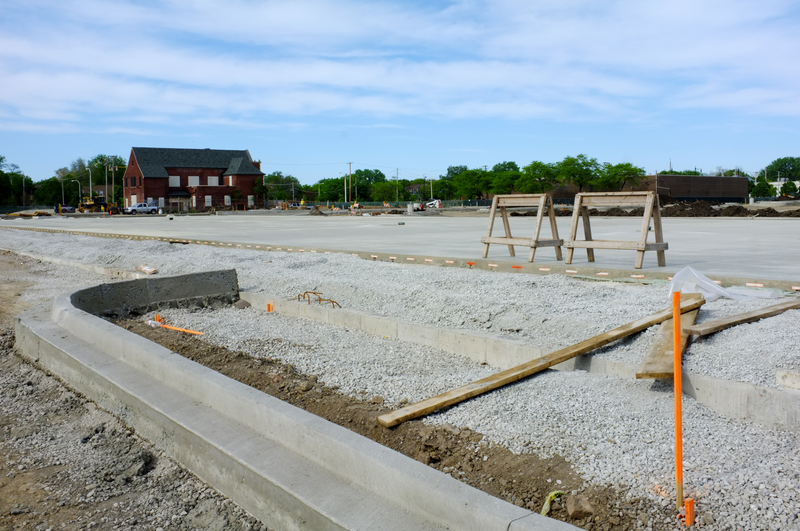 But while the physical building might not exist yet, community members and Whole Foods representatives are already beginning to prepare for the store’s arrival, constructing an image of what having a Whole Foods Market might mean for Englewood. Right now there are no major retailers, and few thriving local businesses, around the site of the future Whole Foods. While Whole Foods seems eager to present their Englewood market as just another of its stores, many community leaders hope Whole Foods will catalyze change in Englewood, by providing fresh food, empowering fellow small businesses, and luring visitors as well as future retail developments to the area. But there’s also a sense in which Whole Foods is arriving on an already changing scene: it’s invested in Englewood’s up-and-coming urban agriculture district, which includes twenty-two neighborhood acres zoned for urban agriculture thus far, and has been in the works for ten years. Even as Whole Foods appears willing to work with and reach out to members of the community, some people in Englewood worry that the store is a sign of gentrification, a signal of the swift development that can dramatically change a community and push low-income residents out. Everyone knows that Whole Foods won’t be Mr. Thomas. But what will it be? of change. As more black residents began to call Englewood home and white flight followed, the community went from eleven percent black in 1950 to sixty-nine percent in 1960. Englewood, as it became an African-American community (ninety-nine percent black by 1990) also began to fall prey to racist policies of redlining and disinvestment. The neighborhood, home to nearly 100,000 people in 1960, now has a population of around 30,000, and many buildings are gone. Williams, whose family moved to Chatham when he was thirteen but continued to return and visit Englewood throughout his life, witnessed the change himself. Englewood’s 63rd and Halsted shopping district changed along with the neighborhood. Pictures from the 1950s show a street packed with well-lit businesses, full of cars parked bumper to bumper and pedestrians streaming out of stores. As part of a new five-acre Englewood Square development, the Whole Foods Market inherits that legacy, a fact proudly touted by developer DL3 realty on its website. And Whole Foods won’t be alone: Englewood Square will also include two “outlot parcels” for more retailers, and is part of a larger thirteen-acre development at the intersection, the rest of which will be developed by the nonprofit Chicago Neighborhood Initiatives Inc. 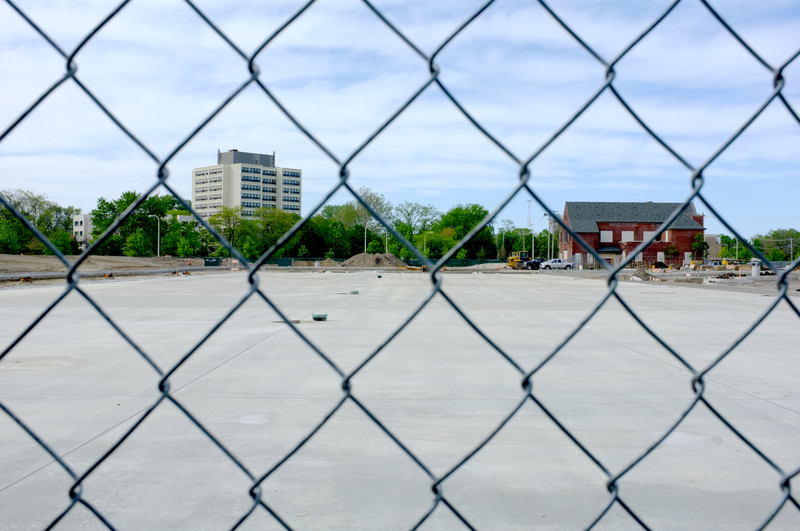 Multiple sources said the rest of Englewood Square could include a Chipotle and a Starbucks, though Leon Walker, manager of DL3 realty, did not respond to the Weekly’s requests for confirmation. 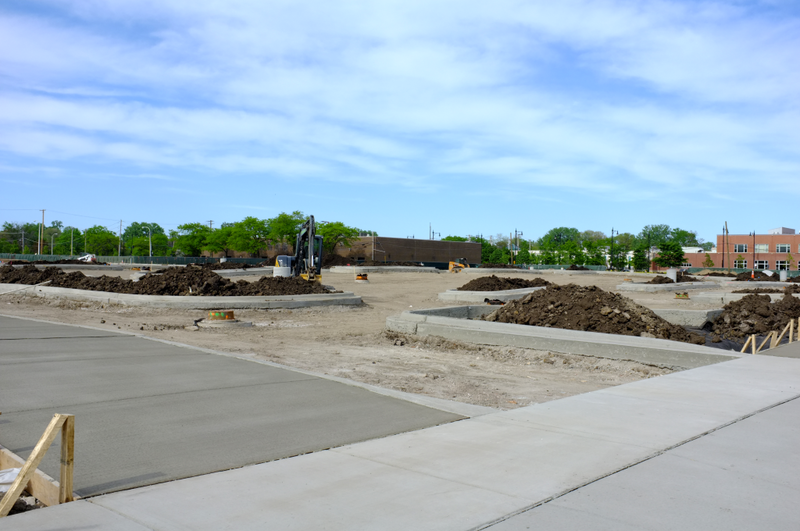 The city council voted in April 2014 to give $10.7 million in tax increment fincancing (TIF) funds to the property to subsidize the development. The neighborhood has already been in the midst of another change. 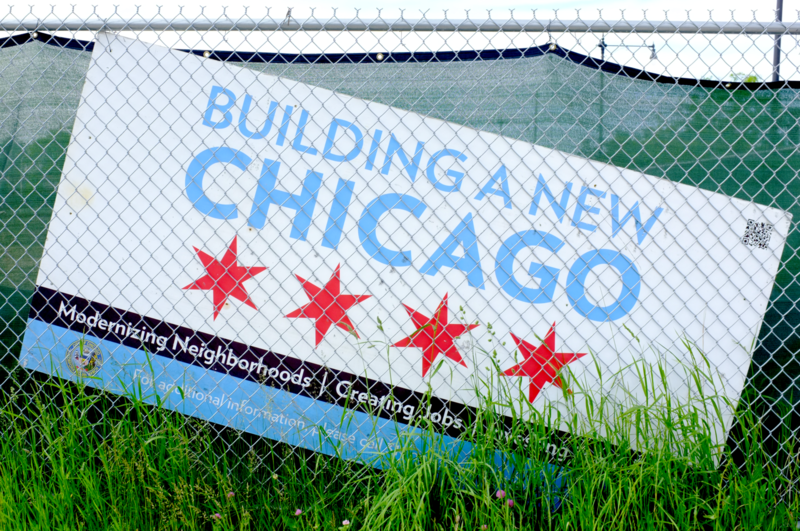 In 2005, Perry Gunn’s organization, Teamwork Englewood, created a “Quality-of-Life Plan” to chart a course for improving life in Englewood. Gunn wasn’t director back then, but he said that 650 people contributed to developing the ten strategies, focused on areas including education, economic development, safety, environment, and crime. The fourth prong of the first strategy reads, “Develop an urban agriculture district to provide business, job training and employment opportunities while improving the availability of fresh produce.” Gunn said the plan also included the goal of bringing a full-service grocery store, like a Whole Foods, to 63rd and Halsted. According to Sonya Harper, executive director of Grow Greater Englewood, an Englewood coalition of groups involved in food production and community outreach, the urban agriculture district was originally just an idea for community leaders. However, it was then taken up by the city as Englewood became a target of the city’s Green and Healthy Neighborhoods Plan, which hopes to appropriate vacant land for urban agriculture, industrial activity, housing preservation, and more. Now, Englewood’s urban agricultural district means that there are twenty-two acres that the city has zoned for urban farming use, according to Harper. However, Harper said it’s not just about farming; rather, they think of it as a food-production district, including the other businesses necessary to support farms, including harvesting, transport, processing, packaging, wholesale, and retail. Harper said they are still working on putting together the district. Currently operating farms include Growing Home on 59th and Honore and 59th and Wood—which has worked closely with Whole Foods since the city announced the store—and the Perry Ave. Community Farm, which, at 59th and Perry, is slightly more removed on the other side of Dan Ryan. 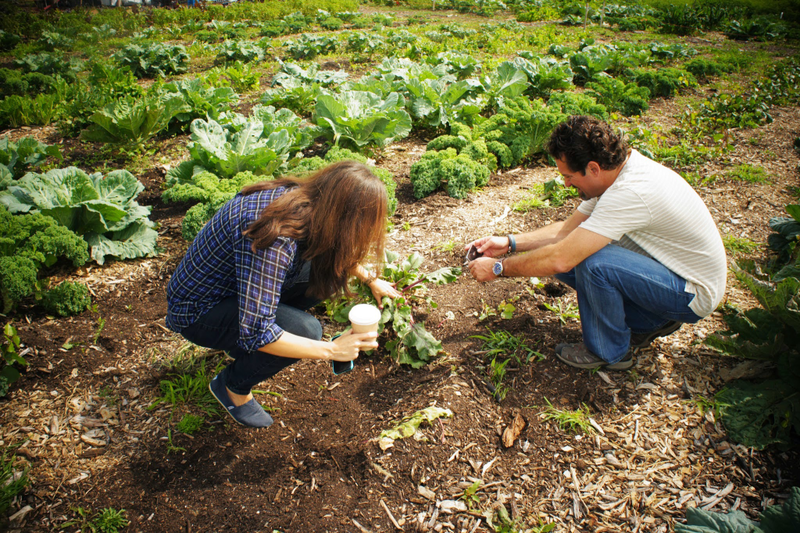 The nonprofit Growing Home’s two farms are the only certified organic farms in Chicago. They sell produce at a farm stand at the Englewood site and at North Side farmers markets. But they also use the farm as a training program for people who face what Director Harry Rhodes called “barriers to employment,” such as criminal records and homelessness. Growing Home’s students work on the farm for fourteen weeks and then are placed in food service jobs. An urban agricultural district thus provides a convenient landscape for Whole Foods, which could stock local produce from in and around Englewood at its stores. “We certainly want to help develop any sort of urban agriculture initiatives in a city like Chicago, Englewood, and beyond,” said Keith Stewart, a marketing director for Whole Foods. 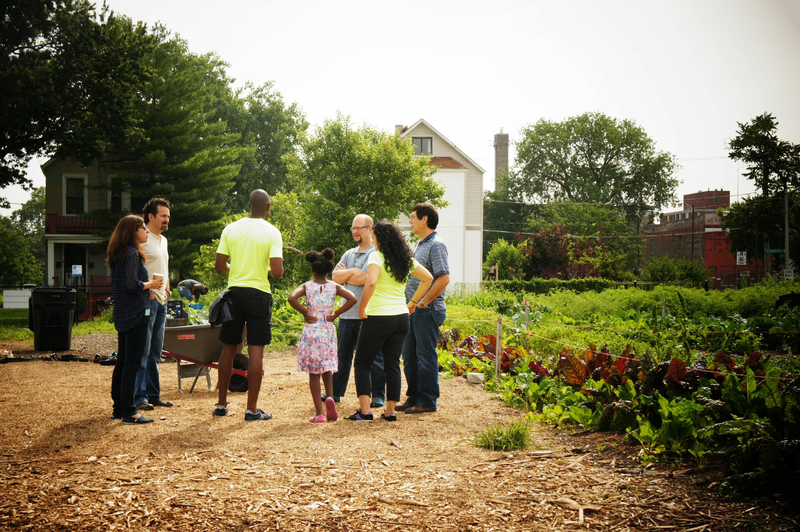 According to Harper, in the weeks leading up to the Whole Foods announcement, Rahm Emanuel visited the Growing Home farm several times and learned about the community’s efforts to use food as a tool for economic revival. Then, one day, he brought the Whole Foods team with him, and shortly after that announced that the store was coming to Englewood. Right after the announcement, Whole Foods donated $100,000 to Growing Home to help them build a greenhouse and hire interns. Rhodes said Growing Home has continued to be active in the process of bringing Whole Foods to the community and has attended all of Whole Foods’s community meetings. “Since we’ve got started, we’ve looked for people, for organizations, for companies that have similar values and Whole Foods is one of them,” said Rhodes. Growing Home has been working with Whole Foods to hire the people they train. So far, Whole Foods has hired two program graduates with non-violent backgrounds for their store in Streeterville. Rhodes said it has been more difficult to get people with violent backgrounds hired at Whole Foods’ Chicago stores, but they’re in talks with Whole Foods about developing a training program for those individuals. Whole Foods has also been in discussions with the Perry Ave. Community Farm. Williams’s Center for Urban Transformation partners with the Sweet Water Foundation to oversee this farm. Across the street from the Metra tracks on Perry, they currently have a farm and a community garden, on a block surrounded by greened-over lots: hardly an urban space. The farm also includes the “Think-Do house,” a renovated foreclosed home used as a vibrant community meeting space. The house has chalkboards and whiteboards for walls, adorned with various quotes and diagrams on urban agriculture in colorful chalk, and bright photos of kids and families at the farm fill the space. Williams said they want to expand the farm into what will be called the Perry Market District, bordered by 55th and 63rd Streets and by the Dan Ryan and Wabash. It’s an attempt to create a community with urban agriculture but also various types of housing and commercial development. Williams wanted to dispel any concerns that the urban agriculture district was about taking over all of Englewood with farms. While the Perry Market District would be part of the urban agriculture district, Williams said other proposed spaces include other parts of the 59th Street corridor and some farming around 71st and Princeton. However, he said that it’s a small percentage of the total six-and-a-half square miles that make up Englewood and West Englewood, and that much of it is near the unused rail lines on the 59th Street corridor. He noted that people in Englewood might not want all of their land taken for farming, and that he’s aware of that. 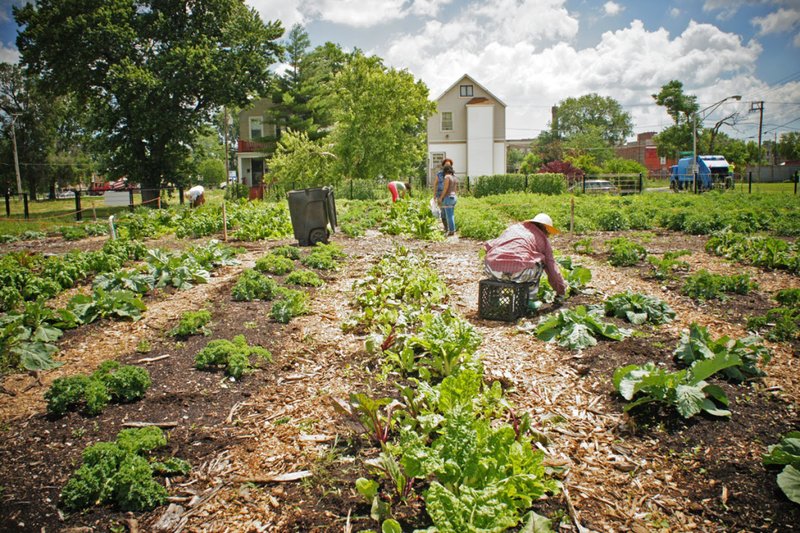 Urban farming, in his eyes, is meant to be just one aspect of community development. Emmanuel Pratt, executive director of the Sweet Water Foundation, the other operator of the farm, said that the foundation has been involved in roundtable discussions with Whole Foods since 2013, including a visit to learn about the Whole Foods store in Detroit. Whole Foods Market is interested in selling some of the farm’s produce, such as kale and chard, and Pratt says that the foundation is interested in selling their surplus (beyond what they already use for community work) if Whole Foods will be willing to help them with training staff in supplier tasks like harvesting, processing, and packaging, and job placement for youth involved in Sweet Water Foundation’s programming. Pratt sees it as an opportunity to train farmers in working with market demands. Euan Hague, a professor of geography and sustainable urban development at DePaul, said it will be interesting to see how Whole Foods ends up working with local growers. Whole Foods’s efforts to work with urban farms and sell their produce is just part, however, of their larger plan to get the products of various local small businesses into their Chicago stores, and many such partnerships are in the works as the store’s 2016 opening inches closer. While it’s typical for Whole Foods to host vendor days and seek local business suppliers when they open a store, the Englewood process was something new. A three-day workshop for small businesses that included information on how to work with Whole Foods took place in January. “[Whole Foods’s] assumption is that the vendor is already ready to do business. Here, most of the businesses that we came across, probably sixty percent, they don’t have certain basics in place,” Jennipher Adkins, marketing director of the Greater Englewood Community Development Corporation (CDC), said. The CDC suggested a workshop series to Whole Foods and Whole Foods agreed wholeheartedly. The three-day workshop included information from the city on business licensing and other aspects of small-business development, as well as Whole Foods’s stringent requirements for suppliers. At the third workshop, on January 23, Whole Foods met with about forty local businesses. Adkins said that now twenty-seven businesses are now in the process of becoming Whole Foods vendors, and five have already become vendors. Whole Foods offers most businesses other Chicago stores where they can sell their products right away, though all will have products in the Englewood store. Adkins said there will probably be another workshop next year. However, none of the businesses chosen to work with Whole Foods so far are actually Englewood-grown. The series attracted businesses from around the Chicago area, and some on the list Adkins gave me of businesses who met with Whole Foods don’t operate on the South Side. Others are based on the South Side, but not in Englewood. “In Englewood, there’s really nothing in terms of being ready to sell to a national retailer,” said Adkins. “There are very few people who are able to do that without assistance. We just don’t have an abundance of that type of business ready to go.” She said that the three Englewood businesses that came to the workshop didn’t get far with Whole Foods because they lacked certain necessities like EPC codes and formulas. Throughout the workshop series, Adkins and the Greater Englewood CDC noticed that Englewood businesses and some other South Side businesses didn’t have basic technology and other necessities such as wraparound services, insurance, accounting and more. 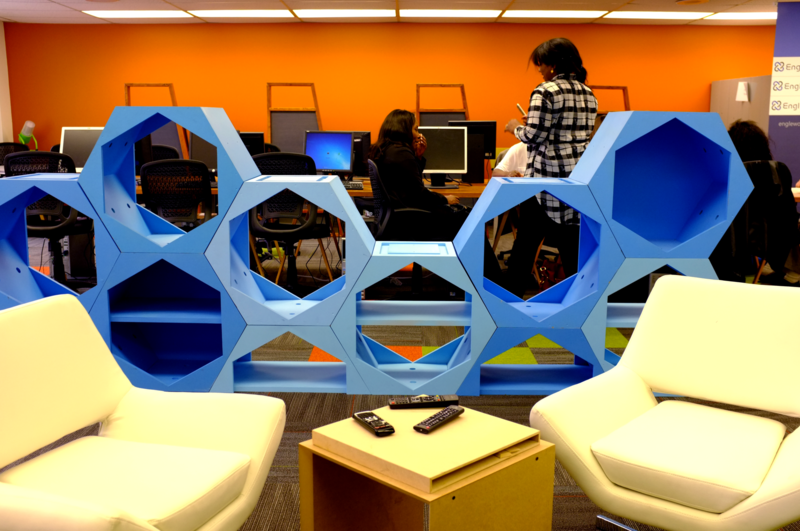 So they partnered with innovation center BLUE1647 to start a business accelerator, which includes technology, meeting space, and coaching support from the Greater Englewood CDC for twenty-five dollars a month. 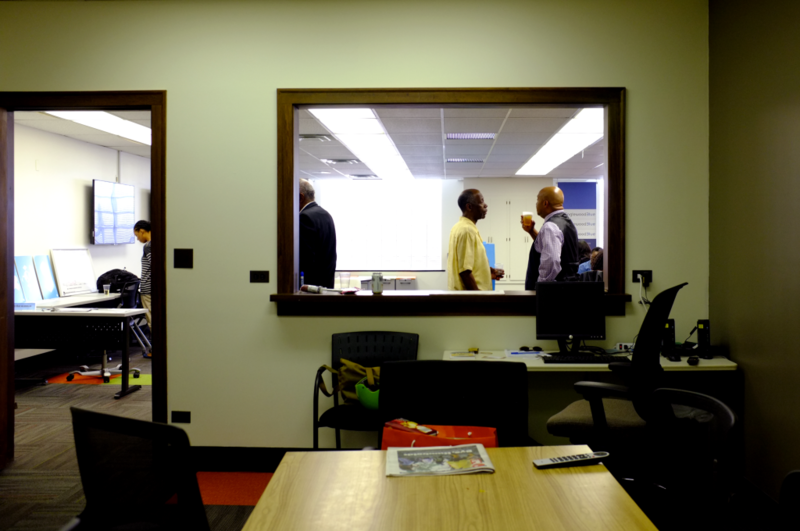 The accelerator, which opened officially on May 1, is located at the Greater Englewood CDC offices, on the fourth floor of a bank building with a pillared facade across the street from the Englewood Square site. The space is bright and modern, with green and orange squares in the carpet, movable furniture and whiteboards, numerous Windows computers, and an attached conference room. When I arrived to meet Adkins, she was in the midst showing off the space to two women, one of whom sold hair care products. I heard her ask one of them if she had been at the Whole Foods workshop. Adkins said that most businesses working with Whole Foods will be using the space. She also hopes that after working with the Englewood businesses and having several more workshops, by the third year there will be a “meaningful number” of Englewood and black-owned South Side businesses with their products in the Englewood store. The idea is that shoppers could put money back into the community by buying locally-owned products on Whole Foods’ shelves, and those businesses could then hire more people. Perry Gunn of Teamwork Englewood said they are also considering creating a commercial kitchen space in the firehouse behind the Whole Foods development for food businesses to share. Gunn said the store could also increase traffic to local establishments, like the Dream Café just a few blocks away at 61st and Halsted. Howard Bailey, owner of the Café, which opened in January, said he is anticipating more business when the Whole Foods comes, because otherwise, he said, there’s not much attracting people to the area, besides the recently-added Kennedy-King college campus on 63rd and Halsted. “It’s like any time you bring a nice anchor store to the community, more people will come,” Gunn said. In fact, Whole Foods is often described as a “catalyst”—a word used independently by many of my sources—for conversations about food access, for attention to small business development, but especially for other development in the area. Many see Whole Foods as encouragement for other outside businesses, like Starbucks and Chipotle, to come to Englewood. Jennipher Adkins sees this as the main result of the store coming in. But Whole Foods, interestingly enough, seems opposed to singling itself out as a catalyst. “We’re not the catalyst of that, we’re just part of it,” Stewart said of Englewood Square. It’s hard to believe him, though, considering the mass of attention that Whole Foods has generated since its announcement. While much of the press coverage has centered around whether Whole Foods’s prices will be viable in a low-income area, Whole Foods has also caused a stir because it’s the first retailer of its kind to move into the area in recent memory. According to Williams, the idea that it’s a necessity to bring an “anchor store” is part of the traditional, mainstream development model. Williams said he personally wishes it was possible to predicate development on a different model: he pointed to Andersonville, which he said worked hard to keep out chain stores and still kept the economy thriving. Williams isn’t necessarily against Whole Foods, but he wishes that Whole Foods would be part of a “broad-based food environment,” with a wide variety of food purveyors among which residents can choose, as he says exists on the North Side. While Englewood actually has several farmers markets that have appeared around the urban agriculture movement (and Jennipher Adkins hopes to start another this summer across from the planned Whole Foods site), as well as a few discount grocers—an Aldi a few blocks from the site and a Food 4 Less in West Englewood—it’s missing locally-owned grocers. Williams said his group is working on including a locally-owned entity, like a benefit corporation or worker-owned co-op, in the Perry Ave. Market District, but planning is still in the works. Even as Whole Foods attempts to get involved in the neighborhood, it’s not an easy task for a store like Whole Foods to enter a severely disinvested area like Englewood and bill itself as a space for residents. “Whole Foods will have to do a lot of community outreach, so that folks know it’s for them and not for some unseen outsiders or for the gentrifiers only,” said Mary Pattillo, a professor of sociology and African American Studies at Northwestern University who has studied development in South Side neighborhoods. The store is in the process of working on that outreach: it has an advisory team made up of stakeholders and residents, according to Sonya Harper of Grow Greater Englewood, which is part of the advisory team. According to Harper, the advisory team has worked with Whole Foods on the physical aspects of the store, since residents wanted the store to artistically represent Englewood somehow. Notes posted online from the Whole Foods community meeting on February 16 suggested that the advisory team was discussing including images of the old 63rd and Halsted development in the decor. Harper said they were also especially interested in having Whole Foods include a free community meeting space in the store, since Englewood has few. The meeting notes indicate community members were also concerned with having Whole Foods be open to hiring people of various backgrounds, contribute to small business development, and partner with the community on nutrition education, among many other items. One line item even reads, “Whole Foods Market must dispel rumors of what Whole Foods Market is so that the community will embrace Whole Foods Market,” speaking to the suspicion generated by Whole Foods’s pricy reputation. So far, Whole Foods seems to have been making a good impression about its willingness to work with community members. Gloria Williams, founder of the resident committee Voices of West Englewood, was similarly pleased. “The reason I think why I feel that it’s going to work out is because, you know, in Englewood you’ve got organizations sitting down at the table with the Whole Foods and they are listening and we’re coming up with solutions to address issues within the community,” she said. However, even Whole Foods’s good impression on community engagement hasn’t completely overridden confusions and concerns around the store, including why it’s coming and whether it will result in gentrification. According to Pattillo, Whole Foods is especially interesting because its announcement followed the opposite pattern of how commercial development often plays out on the South Side. 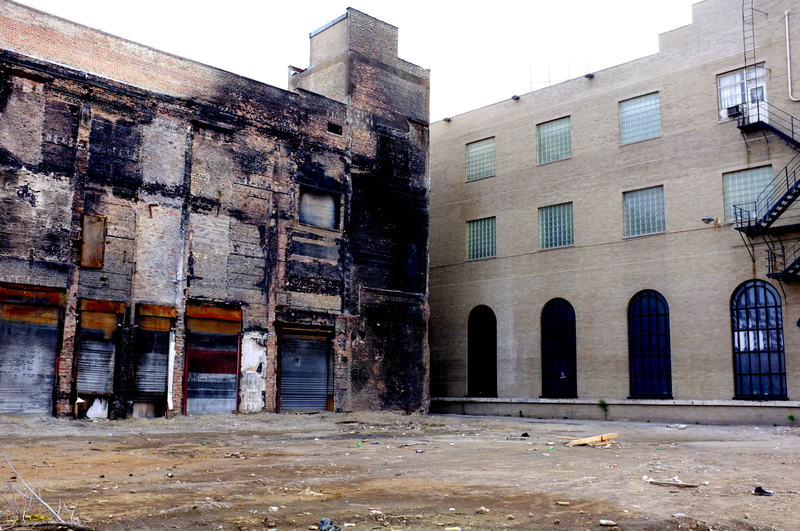 In most cases, she says, residential transformation precedes an influx of retailers like Whole Foods, which occurred in North Kenwood, Oakland, and Bronzeville. Because that stabilization of housing stock hasn’t yet occurred in Englewood, she’s “baffled” as to why Whole Foods has decided to come. In the past, Whole Foods has been noted for its ability to predict when areas are on the cusp of gentrification, and even to contribute to that gentrification itself. Salon, reporting on Whole Foods’s opening a store in Midtown Detroit in 2012, said that the “retailer has made a science of putting down roots in urban locations at what often seems to be just the right moment.” While Whole Foods doesn’t usually raise property values of its own accord, it signifies to other retailers that the neighborhood is investment-worthy, and it generates data on its success that other retailers can use when trying to get a loan to come to the area. Even though there hasn’t been any gentrification in Englewood as of yet, and Englewood is different than any neighborhood Whole Foods has entered before, the mention of the potential trio of Whole Foods, Chipotle, and Starbucks is enough to raise concerns. If that is Englewood’s fate, even good community relationships with Whole Foods might not be enough to ward off this type of change. Williams says the Center for Urban Transformation and the others working on the Perry Ave. Farm are taking steps to safeguard against gentrification. They’re already planning to pursue the community land trust that Pattillo mentioned. “One of the things we’re concerned even with our project is we don’t want to be a catalyst for that gentrification and so that’s why we’re paying attention to affordable housing, things like community land trusts that puts land or properties into trusts so that they don’t become subject to the whims of the typical market,” he said. Despite her excitement about the new development, Adkins, too, said she understood there were “huge concerns” about gentrification and how Englewood might look in five years. She said the Greater Englewood CDC’s stance is to accept the new store if it’s bringing in good things like new jobs, but to try and keep as many people in the neighborhood involved as possible. Adkins also said that while many people don’t understand why pricy Whole Foods is entering Englewood, Emanuel and Thompson had also asked other food retailers—like grocery chain Jewel-Osco, which used to operate in the area—to come to the development first, but they said no. Just as community leaders like Adkins, Williams, Gunn, and Rhodes have varying ideas about Whole Foods’s entrance, so too do other Englewood residents. Some don’t want to talk about it, some just say, “I think it’s a good thing” and leave it at that, while others point out that the prices would be too high. Englewood resident Angela Doss, walking near 67th and Halsted this past Saturday, said she’s excited about the store. “I think it would be a good experience to have some fresh food,” she said, adding that she hoped the prices would be reasonable. She said she thought the location was a good choice, easy to get to. When I asked her about the possibility of the Chipotle and Starbucks coming as well, her face lit up. “That’d be a treat,” she said, referring to Starbucks. Ricardo Perkins, who I met walking on 63rd Street on the opposite side of the street from the Whole Foods, said that people he knew were confused and worried about the store coming. Perkins says he knows that Whole Foods is healthy, but he and many others can’t afford to shop there. Correction: An earlier version of this story stated that it has been more difficult to get people with non-violent backgrounds hired at Whole Foods’ Chicago stores. It has been more difficult to get people with violent backgrounds hired at Whole Foods’ Chicago stores.